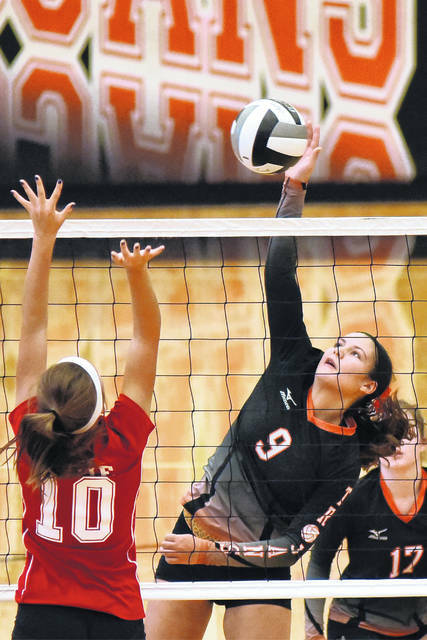 Arcanum junior Camille Pohl (9) has been named the Cross County Conference Player of the Year for girls volleyball. Camille Pohl helped lead Arcanum to a runner-up finish in the Cross County Conference volleyball standings with a stat line of 282 kills, 296 digs and 32 aces in 69 sets of play. The Trojans were 11-1 in the league and 19-3 overall as they head into the Division III sectional tournament as a No. 5 seed. The 5-foot-9 junior was recently named as the CCC Player of the Year for her efforts. 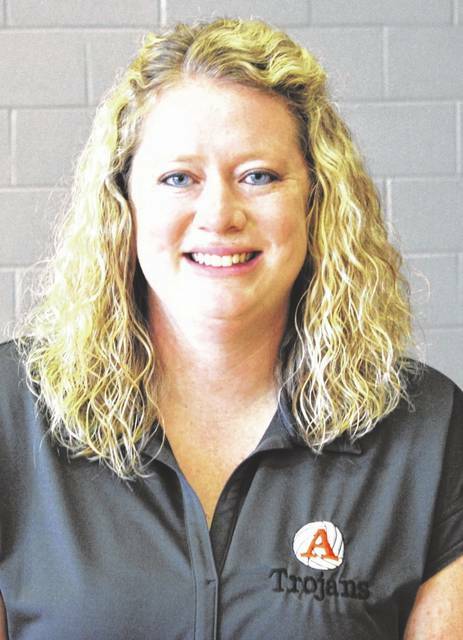 Arcanum coach Macey O’Dell also was named Coach of the Year. She was joined on the CCC first team by fellow Trojans junior Audrey Heiser and freshman Taylor Gray. Arcanum senior Macey Hartman was named to the all-league second team and fellow senior Sadie Sink received honorable mention. Other local players receiving all-league recognition include Franklin-Monroe’s Corina Conley and Brigette Filbrun, both of whom were named to the CCC first team. Kennedy Morris and Chloe Peters were named to the second team for the Jets and Belle Cable received honorable mention. Maddie Downing of Tri-Village was named to the first team, while her teammate Edie Morris was named to the second team and Abbi Lipps received honorable mention. Mississinawa Valley’s Sidnie Hunt also was named to the first team. Olivia Murphy and Riley Price were named second team and honorable mention respectively. Ansonia’s Trinity Henderson and Bradford’s Macie Reck each received honorable mention in the league. Other players named to the first team include Klaudia Lowery (Bethel), Lillian Hamilton (Covington), Lydia Conley (Miami East), Gabrielle Hawkins (Miami East) and Sophia Jacomet (Miami East), Others on the second team are Connor Heck (Bethel), Makenna Gostomsky (Covington), Nichole Hood (Miami East), Tristan Bowers (National Trail), Alyssa Rapp (Newton), Riley Cruse (Tri-County North) and Sidney Mowell (Twin Valley South). Also receiving honorable mention were Emily Berkshire (Bethel), Ellery Reck (Covington), Ashlyn Monnin (Miami East), Lexi Stiner (National Trail), Madison Hildebrand (Newton), Emma Hale (Tri-County North) and Mackenzie Neal (Twin Valley South). The final standings in the CCC were as follows: 1. Miami East 12-0 (14-8 overall), 2. Arcanum 11-1 (19-3), 3. Franklin-Monroe 10-2 (18-4), 4. Tri-Village 9-3 (17-5), 5. Bethel 6-6 (11-11), 6. Mississinawa Valley 6-6 (10-12), 7. Covington 6-6 (9-13), 8. Twin Valley South 5-7 (10-12), 9. National Trail 3-9 (8-14), 10. Tri-County North 3-9 (6-15), 11. Newton 3-9 (6-16), 12. Bradford 2-10 (6-16), 13. Ansonia 2-10 (4-17). Miami East was crowned league champions with a perfect 6-0 record, but Bethel’s Darani Wenrick was voted as the Cross County Conference Player of the Year and Bethel’s coach Dru Bescoe was named Coach of the Year. The All-Conference team included one player – junior Chloe Brumbaugh – from Franklin-Monroe. Receiving honorable mention for the Jets was freshman Maya Diceanu. The rest of the all-conference team includes Natalie Moorman (Bethel), Machaela Staggs (Bethel), Emily Adkins (Miami East), Cerstin Gross (Miami East), Whitley Gross (Miami East), Savannah Nehring (Miami East), Gracie Jones (National Trail), Crystal Houk (Newton), Michaela Kirk (Newton), Kim Laughman (Newton), Taylor Green (Tri-County North), Allison Bassler (Twin Valely South), Makiah Newport (Twin Valley South) and Kassidy Whaley (Twin Valley South). Others receiving honorable mention are Hannah Marzolf (Bethel), Kelly Buck (Miami East), Brooklyn Anderson (National Trail), Marissa Deeter (Newton), Preston Lipinski (Tri-County North) and Madi Hundley (Twin Valley South). The final standings in the CCC were as follows: 1. Miami East 6-0 (9-5-1 overall), 2. Bethel 5-1 (9-5), 3. Newton 3-2-1 (4-8-2), 4. Twin Valley South 3-2-1 (6-4-4), 5. Franklin-Monroe 2-4 (2-11), 6. Tri-County North 1-5 (1-3), 7. National Trail 0-6 (2-6-1). This entry was tagged Arcanum, Camille Pohl, CCC, Macey O’Dell. Bookmark the permalink.